Don’t allow anyone to touch or drive over a power line. Always assume a downed line is dangerous. Downed or damaged power lines can send electrical currents through tree branches and metal fences, so survey the area carefully – especially if you’ll be using a pruning pole, ax or chainsaw. When the storm has passed and power has been restored, it’s safe to plug in and turn on your appliances, but do them one by one, to avoid overloading a circuit. Utility crews, along with law enforcement and medical teams, need to reach storm sites quickly to prevent further injury and damage. 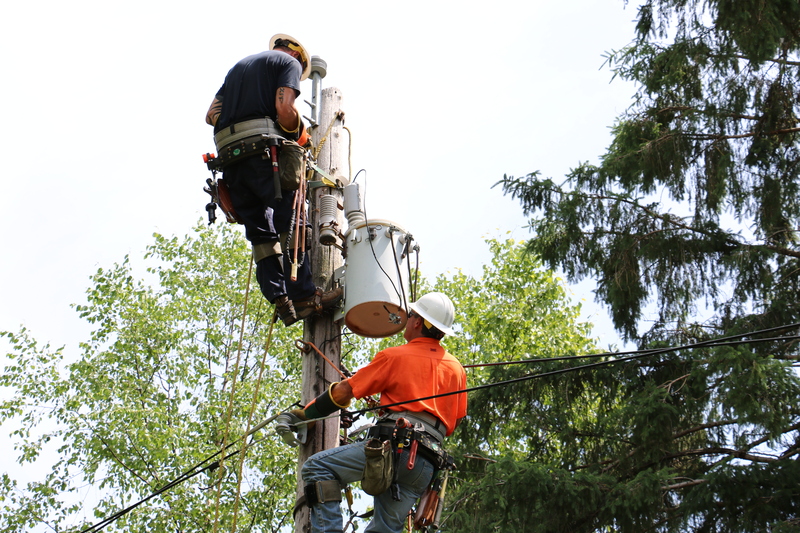 What may seem like help can actually cause more work – and even additional outages – for our crews to deal with. Curious bystanders can hamper efforts to help people and restore power. Depending on the damage, there are times it may be necessary to contact a licensed electrician for additional repairs. By law, we can only repair the incoming service line and the meter itself. Repairs to weatherheads, meter boxes and other hazardous equipment should be done only by a licensed electrician. See the diagram to learn what equipment you need a professional to repair on your property. Repairing the electrical service into your residence or building is not a “do-it-yourself” project. Leave all work to trained and licensed electricians. Attempting repairs yourself is extremely dangerous, with the potential for serious injury and fires. It could also cause expensive damage to your home’s electrical system and appliances. Avoid opening the refrigerator or freezer door. Refrigerated food will stay cold up to six hours; frozen food will keep for about two days if the door to the freezer isn’t opened. If the outage will be longer, pack refrigerated items in an insulated cooler surrounded by ice. When the power comes back on, use a thermometer to check the internal temperature of the food; if it’s less than 40 degrees, it’s safe to keep. If frozen foods still have ice crystals, they can safely be refrozen. For additional information about storm safety, visit alliantenergy.com/safety. More than a dozen Alliant Energy customers, mostly in the Cedar Rapids area, reported receiving scam phone calls about meter exchanges in the past few days. In these recent contacts, scammers are apparently telling consumers that Alliant Energy will install a new meter and raise customer bills by a certain percentage. Some of the scammers appear to have been asking for account information or to sign up for new electric service. These calls are not legitimate. We remind customers not to give out personal information over the phone. Meter exchanges, when necessary, do not have a fee, are not accompanied by higher bills and do not require verification of any personal information. The more common scam phone calls threatening disconnection if customers do not immediately purchase a prepaid card have continued off and on across our service area for the past few years. We do not ask customers to purchase prepaid credit cards or make immediate cash payments over the phone. If someone calls claiming they represent Alliant Energy and demands immediate payment or personal information, hang up and call us. Do not give in to a high-pressure caller seeking personal information. Do not provide your Social Security number, credit card numbers or bank account information to anyone who requests that information during an unsolicited phone call or an unannounced visit. Beware that scammers can spoof caller-ID displays, which means they can mask the call’s true origin and make it appear as if the call is coming from a utility company. For more information, visit alliantenergy.com/paymentoptions or “How to spot a scam”. DUBUQUE, Iowa –Energy experts with Alliant Energy will be in Dubuque over the next few weeks conducting free energy assessments ($500 value) for small business customers. A trained energy professional will visit businesses to evaluate the building’s shell, heating and cooling system, insulation and lighting. Installation of free energy-saving products like compact fluorescent light bulbs and programmable thermostats will be included. Following the assessment, each business will receive a report which summarizes the building’s energy performance and recommendations for improvements. Information about Alliant Energy rebates will also be included to help offset the cost of making efficiency upgrades. As a bonus, businesses may also qualify for Alliant Energy’s Small Business Energy Solutions program. This turnkey-lighting program pays up to 75% of the total project costs. This simple, streamlined process is designed to work within the busy schedules of small business owners. 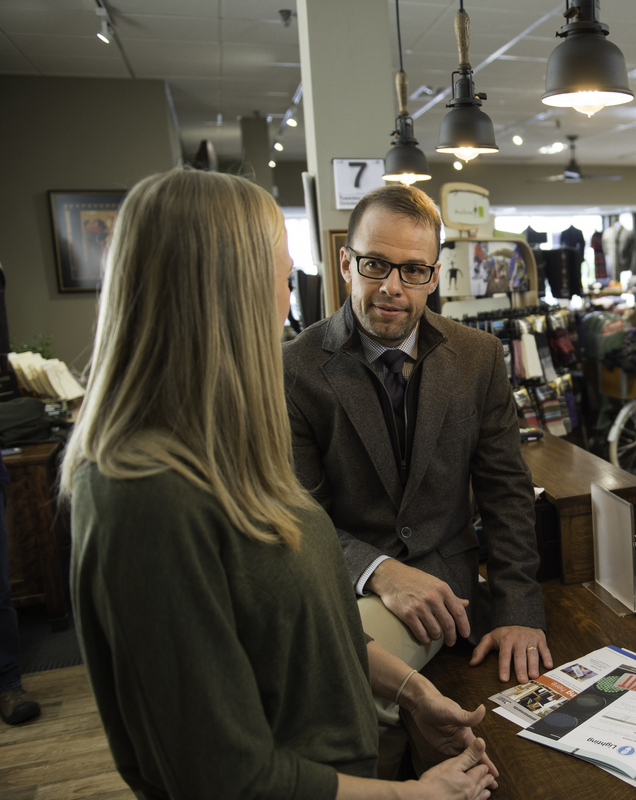 Local business owner Ben Graham of Graham’s Style Store recently completed an energy assessment and lighting upgrade through Alliant Energy’s small business programs. The work was honored at the 2015 Main Street Iowa Awards, winning the best interior rehabilitation category. To qualify for these programs, businesses must receive utility service from Alliant Energy, have annual billing of less than $50,000 and occupy less than 20,000 square feet. If the building is leased, property owner approval is required. Businesses may visit alliantenergy.com/startsaving or call 1-888-267-7516 to schedule an energy assessment. Incorporating energy efficiency means our customers can save money and reinvest those dollars in other areas of their business, improving their bottom line. On May 19, we were pleased to recognize 13 organizations, throughout Iowa, that received Excellence in Energy Efficiency Awards from the 9th annual Energy Summit in Cedar Rapids, Iowa. The organizations and companies were honored for their leadership and vision in incorporating energy-saving projects and technology into processes and facilities. “These investments not only provide energy and cost savings, but can provide our customers a competitive advantage to grow their business. Congratulations to all of our award winners for their honors and for being leaders in energy efficiency,” said Doug Kopp, president of Alliant Energy’s Iowa utility. Visit alliantenergy.com/energysummit to view video documentaries on each of the award winners and Energy Summit photos and presentations.